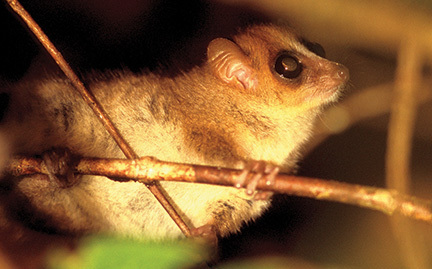 Mouse lemurs are nocturnal primates that spend most of their time in trees, leaping with ease between branches. They live in female-dominated groups of up to 15, sleeping together in nests during the day and foraging close to the ground at night. The name lemur comes from the Latin word lemures, meaning “spirits of the night.” Many Malagasy people believe lemurs are like ghosts because of their eerie vocalizations, reflective eyes, and night activity.